Music plays softly in the background as Tiny Tykes students enter the room for Studio 123 and take in the vivid colors and textures of the materials for the day. Sometimes it is paint, watercolors, or chalk; other times it may be scraps of fabric, assorted colorful bottle caps, or leaves and sticks. There are no examples to follow; students are just encouraged to fill their paper (or other canvas material) completely. This approach is called process-based art, and it is about the experience of making art rather than producing a specific product. 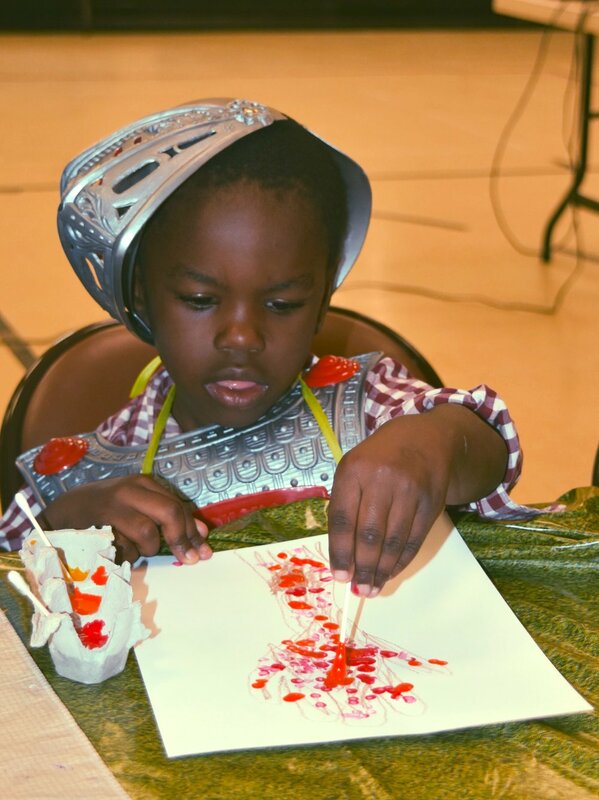 Giving children space and time to express themselves through this open-ended art process aids with their social-emotional development. Students that have trouble staying calm and positive during other types of activities find Peace during Studio 123 as they sit calmly and focus on a work of art that is completely their own. Where are you finding Peace in your daily life? In this season of Advent, I am reminded of the manner in which the Lord’s Peace abides at Tiny Tykes. Each student is prayed over by staff and receives a visit from their teacher to their home. Every classroom has a calming corner that allows children time and space to process and regulate their “big emotions”. Teachers are trained in trauma-informed practices as well as our new social-emotional curriculum, CSEFEL, so that they can effectively address behaviors without escalating the situation. All of these intentional rhythms and techniques are designed to support our students with hopeful expectation that they would flourish and experience life to the full. Our staff intentionally cultivate a safe, loving environment that allows children to be themselves, make mistakes, and grow. Sometimes our students have environments outside of Tiny Tykes that provide these same accommodations, and we supplement and reinforce the good things already taking place in their lives. Other students rely heavily on their experiences at Tiny Tykes to help them build resilience amidst challenging circumstances. By God’s grace, each one of our students and each one of us can experience the Lord’s Peace. Regardless of the situations our children may be coming from, every child benefits from the intentional care of their teachers, and is better set up to succeed and experience life to the full.